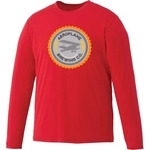 Team athletic wear has never been as functional or fashionable as these great Team 365 long sleeve performance custom t-shirts imprinted with your corporate logo. Show your team style and promote your corporate brand on these great Team 365 long sleeve performance custom t-shirts that works as hard as you do! If style, fashion and comfort are what you are looking for when it comes to promotional apparel, then look no further than these great boxercraft Varsitee slub custom t-shirts. Bring style, performance and quality to your branded promotional apparel with these tultex fine jersey custom t-shirts imprinted with your custom designed full color logo. This white Delta Pro Weight Custom T-Shirt is made of 100% pre-shrunk cotton that is very soft and comfortable. 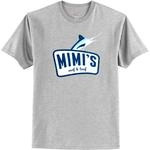 Imprinted with your logo, clients and employees will proudly wear this comfortable shirt for years to come! This Port & Company Custom T-Shirt & Sunglasses Gift Box is perfect for events of all sizes! Add your imprint to the t-shirt and sunglasses, then completely design the gift box to meet your branding needs. This white Delta Magnum Weight Custom T-Shirt is so comfortable and made from 100% pre-shrunk cotton! Add your branding, team name, or design to create a unique shirt that will stand the test of time. The Kemah long sleeve custom t-shirt is made from 100% micro polyester mesh knit allows moisture to escape from your body. Keep cool under pressure or when working out in these great Clique Ice Tee long sleeve performance custom t-shirts. A best-seller! 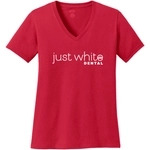 This white Port & Company Fan Favorite Custom Tee in white is fit for any event or occasion. This tee is made of 100% cotton making it comfortable to wear at any time of the day. Stay cool in any environment or during rigorous activities with these great Clique Ice Tee long sleeve performance custom t-shirts. Kick off a company initiative with these fun Full Color Sequin Custom T-Shirts! The sequins change color from white to silver when brushed in opposite directions.